NEW VERSION OF ISO 6579, for the detection of Salmonella spp. Just out of the ISO oven, we present you the new version of the ISO 6579 (ISO 6579-1:2017) for the Detection of Salmonella spp., recently approved. As in the previous one, this new version indicates the use of a second selective plating medium that has to be complementary to XLD agar and allow the detection of lactose positive and H2S negative Salmonella. As you already know, CHROMagar Salmonella Plus was designed to answer the ISO 6579 requirements and complies perfectly with them. 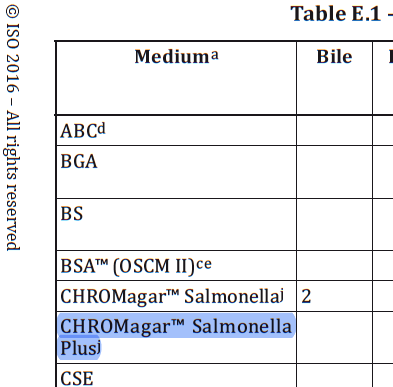 Most important, in Annex E of this new version there is a list of selective plating media that can be used in accordance to the ISO 6579, and CHROMagar Salmonella Plus is included.